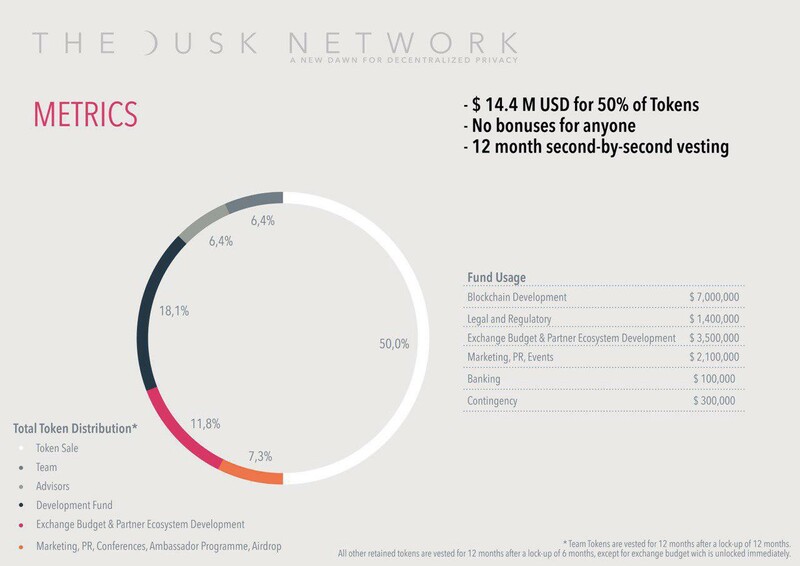 Over the last weeks the demand for the Private Sale has exploded, and we have been working around the clock to meet with all prospective buyers and partners to ensure Dusk Network’s support system is as strong as it can be. To help us process hundreds of conversations, we recently announced our fundraising partner The Reserve. We have received some constructive feedback from our advisors on our current lockup configuration. This configuration could lead to a suboptimal situation in which progressive batches of unlocked tokens potentially lead to unwanted sale pressure. To mitigate this possibility and promote a broader holding horizon, we have decided to remove all bonuses. That way every participant in the private sale will be treated equally, which makes the fundraiser fairer. This also warrants that there will be no inside deals. Confirming our standpoint on this, the exchanges we are in talks with also consider large bonuses as a red flag. Our commitment to be best-in-class means we will not use bonuses just to “bribe” big names to hop on board. Being fair, transparent, and offering all buyers the same terms is key in today’s blockchain space — and rightly so. This preserves the integrity of the project and ensures that those who purchase DUSK 1) believe in the fundamental value of the project and 2) are with us for the long-haul. To complement to the points above we, as the Dusk team, truly believe in the project and its long-term vision. To show our commitment, we will extend our lockup period to a 12 month lock up and a 12 month vesting period thereafter. We have always believed in raising an appropriate amount of capital. We want to be able to optimally build Dusk Network, but also bring a fair proposition to the market. Due to this extreme demand for Dusk and the current configuration with a limited availability of funds, this would lead to a situation in which many value-adding sale participants would be left out while potentially concentrating stakes of Dusk tokens in the hands of few holders, hampering decentralization. Hire more of the world’s leading developers, thus speeding up our present timeline and securing our competitive foothold. Further build out our rapidly growing community and increase our capacity to engage with them. Design and implement a robust go-to-market strategy using our increased marketing and PR budget. Expand our roadmap to include zero knowledge smart contracts. Ace the Restricted DevNet launch of Dusk Network at the Next Web on the 14th of December and establish our strong and fair market presence for years to come. Accommodate the overwhelming interest and value-add that prospective partners have been bringing to the table. Conclude agreements with one of the world’s leading exchanges, who we will now be able to accommodate as a private sale contributor and partner as well as secure a free listing. Onboard corporate partnerships that will contribute directly to the utility of DUSK, for example Telcos and financial institutions. Not only do we believe that raising the cap is the right course of action, but our advisors have also strongly recommended it. Private sale participants that have already contributed capital all voted unanimously in favour of this change. This means that every contributor, individual and entity in the Dusk camp has given full support to this decision. No bonuses. Everyone has the same terms. Hard cap has been increased to $14.4m for 50% of tokens. We would like to take the opportunity now to thank our existing partners and everyone that has expressed an interest in supporting Dusk. The increase in the hard cap will allow more of you to join us on this journey. Introducing Dusk Network to the public is an important and exciting step in our journey to create the world’s preferred decentralized protocol for payments, communications and value transfer. We are not here to make a quick buck. We are not here to create hype without valid cause. We are here to do things properly. We are here to lead the market into the new dawn of privacy and compliance, of unstoppable value and asset transfer at negligible cost. We are here to stay. This is why we have been focusing on building our ground-breaking new tech stack over the past 12 months and have only recently opened up the project to outside contributors. Our goal remains the same: to make Dusk the most utilised and beneficial decentralized protocol in existence. Increasing our budget allows us to attract more developers across the entire Dusk spectrum. Additionally, we would like to welcome two new members to the Dusk Core team, Toghrul Maharramov (NeoResearch) and Kevaundray Wedderburn (NeoResearch). Our PR and event campaign for the rest of the year. Our EU grants trajectory, which Dusk Network is currently applying for.